Introducing the Next Adventure Magic Series! CHESTER, Md. 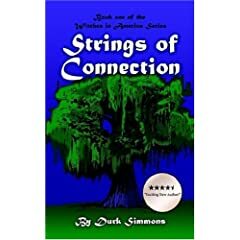 – Combining fantasy with what “real witches” call Wicca, Durk Simmons’ new novel, Strings of Connection – Book One of the Witches in America Series (now available through AuthorHouse), invites readers to enjoy contemporary fantasy magic through the eyes of a family of modern-day witches. The story opens as 13-year-old Kaleb Cunningham wakes up the morning after a sleepover at his best friend Mike’s house. It is Kaleb’s birthday, and later his parents are taking him out to celebrate. Kaleb and his family are pagan witches; Mike is Catholic. In a series of flashbacks, Simmons takes readers back to Mike’s arrival in the neighborhood, when the spirits of Kaleb’s long-dead ancestors – who built Mike’s house – welcome its new occupants. It is Kaleb’s dad, Hank, who convinces Mike’s family to stay, encouraging the boys to become friends despite their extreme religious differences. Time travel, the influence of the Ancient Ones (Hank’s ancestors), magic spells and the truth about Hank’s heritage are all woven seamlessly into Simmons’ richly detailed narrative. When Kaleb learns he is going to the Dark Forest to celebrate his birthday, he is given his parents journals to read. Through their writings and the knowledge they gained as time travelers, Kaleb leans the real history of his family. He meets the Ancient Ones and discovers that he too has magic powers: he can fly, read thoughts and manipulate the strings of connection that touch everything in the universe. Kaleb is inspired by his newfound skills, and begins to see the world in a whole new light. The volume ends with Kaleb talking to his parents about how their magical skills can be used to help mother earth. He suggests they build a modern coven and make it a learning center for the lost craft. Simmons lives with his wife and their two children on the Eastern Shore of Maryland, where he is currently working on the next installment. He has researched and practiced Wicca for many years. This is his first book. Ø Wicca*/Witchcraft (*Wicca is a modern witchcraft religion founded in 1954 by Gerald Gardner after the abolition of Witchcraft laws in England. Gardner called his new religion “Wicca,” for “wise,” and likened it to a resurgence of European witchcraft, which he believed was a collection of ancient Pagan religions maligned and demonized by Christian Missionaries) is considered by many to be the first religion followed by man. Primitive cultures used figures to represent the god and goddess, usually a woman to represent the Goddess of Fertility, and a horned figure to represent the God of the Hunt. These two entities were the paramount figures because of the sheer importance to their survival, offspring and food. Ø Wicca is considered an “Earth Religion” worshipping nature and the environment, and their close connection to it. Their holidays are based on the change of the seasons, and they often use the phases of the moon as milestones in spell-craft work. Ø Wicca differs most dramatically from Christianity because it is polytheistic, recognizing the Goddess as well God, commonly referring to them as the Earth Mother and Sky Father, recognizing the balance of all things. Ø Unlike ‘organized’ religion, Wicca allows it adherents to consider all paths, and encourages new ideas. Ø Many that follow Wicca combine it with their belief in Jesus and Christianity. Ø Wiccan’s believe in the three-fold rule, that being whatever act you perform- be it good or bad, it will come back to you three times, like instant Karma. Ø The Wicca creed is “And it Harm None, Do what Thy Wilt”. Ø Wicca has nothing to do with the common belief that Wiccan’s are evil, or that they worship the Devil. Wiccan’s do not believe in the existence of ‘hell’ or the Devil. Ø Most Wiccan’s believe in reincarnation. Please click below on “EXTRA-SENSORY PERCEPTIONS” (on the blog) to leave a comment, or just say hello! Don’t forget this qualifies you to enter the current competition, too. Just let Sassy know which prize you want to WIN! Previous Entry 334. Alternative PRESS RELEASE: Pssst. Did you know?